Biochemistry is the study of living organisms and their biological processes. You will study macromolecules such as carbohydrates, lipids, nucleic acids, and proteins. Students interested in both chemistry and biology can find a great compromise with a major that bridges the gap between the two and overlaps molecular biology and genetics as well. Practice research techniques, understand data interpretation, and dig deeper into an exciting field of science. To learn more about LECOM, click here. Heidelberg’s Chem Club is part of the American Chemical Society Student Affiliate. The club sponsors events that provide chemistry and biochemistry students with professional experience. Every year, the club takes trips to laboratories, graduates schools, and the National American Chemical Society Conference. Heidelberg's Chem Club has won the Outstanding Award from ACS for the past three years - the only private college in Ohio to do so. There are many different paths you can take when you graduate from Heidelberg with a degree in biochemistry. Some of our students seek jobs right after graduation while others enter graduate programs in both biochemistry and biochemistry-related fields. You could also pursue other professional fields such as medicine, pharmacy, engineering, or business. What kinds of jobs are out there? You can find biochemistry majors holding a variety of jobs including crime lab analyst, biochemist, molecular biologist, pharmaceutical researcher, physician, forensic scientist, and biotechnologist. Heidelberg biochemistry majors have an outstanding record of success with a 100% placement rate within six months of graduation last year. This included both employment and graduate school, which included schools like Brown University and the University of Cincinnati. Our biochemistry curriculum fulfills 80% of the requirements for medical school. View the biochemistry major requirements. For a more detailed academic schedule, or to ask questions about any of our majors, contact the Admission Office at admission@heidelberg.edu or 419-448-2330. Dani Blum is at Brown University in a five-year chemistry Ph.D. program. 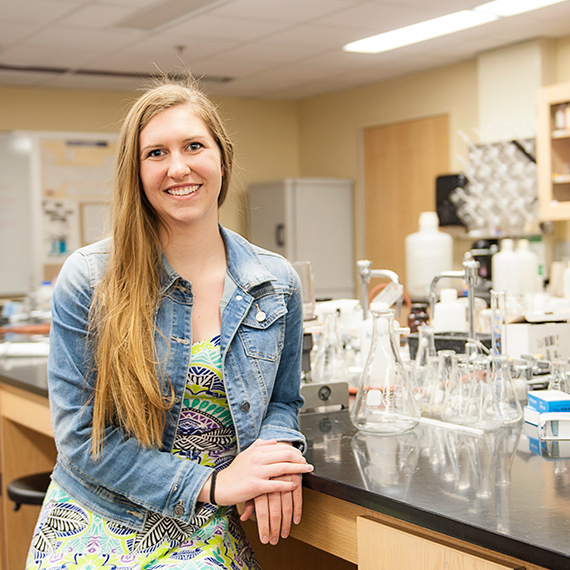 She's working on inorganic projects with an environmental impact, which perfectly fits her biochemistry background.